Globally, the population is aging rapidly. Projections show that elderly population will double by 2050. To find the correlates of CMDs. A community-based cross-sectional study was done in Thondamanatham, the largest of the four villages under the care of the Jipmer Rural Health Centre (JIRHC) of the Jawaharlal Institute of Postgraduate Medical Education and Research (JIPMER). The health center is manned by a chief medical officer and his/her health team. One public health nurse along with one staff nurse/auxiliary nurse midwife is incharge of each village. In addition to providing comprehensive care to the people in their respective villages, they also enumerate all the villagers annually, and the details are entered in an enumeration register. The total population covered under these villages was 9101 as on 2012. The total number of elderly was 693 (7.6%). The study included individuals who were aged 60 years and above. Elderly who had difficulty in hearing or were unable to respond due to conditions such as stroke were excluded from analysis. The prevalence of CMDs among the elderly from a previous study done in rural parts of Maharashtra was found to be 41.3%. Using this prevalence and an absolute precision of 5%, the sample size was calculated using Open Epi version 3.01 as 243. Since the elderly population in the four villages was homogenous and the total number of elderly in Thondamanatham village was 288, all the elderly in Thondamanatham were included in the study. Even though the list of elderly and their addresses was available in the enumeration register, each house in every street of Thondamanatham was visited and the presence of elderly in the house was inquired into and confirmed through the voter ID card. In this way, all the elderly were covered in the study. The houses which were either locked or where the elderly individual was not present at the time of the visit were noted down in a register and were revisited at least three times. If at the end of three visits the elderly individual was not found, then that person was excluded from the study. The study was part of a postgraduate thesis and JIPMER Institute Ethics Committee had approved the project in the year 2011 (Project No: SEC/2011/4/43). After the elderly individual was identified, informed consent was obtained and adequate time was spent to build rapport with the study subjects. The details were collected by a one to one interview conducted by the first author, in a place which offered privacy and efforts were taken to ensure that no family members were present at the time of the interview. We had used a questionnaire that was structured and pretested to collect sociodemographic details. CMDs were screened for using General Health Questionnaire 12 (GHQ 12) which is validated in the local language. The sensitivity and specificity were found to be 87.4% and 79.2%, respectively. Cronbach's alpha was found to be 0.86. Each of the 12 items in the GHQ 12 was scored on a Likert scoring style (0-1-2-3). The total scores range from 0 to 36. The threshold for screening positive for CMDs was taken as a total score of 12 and above. The investigator was trained in administering the questionnaire. The outcome variable is the presence or absence of CMDs as determined from GHQ-12. Oldest-old: 80 years and above. Secondary and above: Classes 9 and 10 and higher education. Class V: Per capita per month income less than INR 660 (less than USD 9.9). Marital status categorized as married and widowed. There could be a potential interaction between gender and marital status. Data were collected and entered in Microsoft Excel 2010 and were analyzed using IBM SPSS version. 21 and Open Epi software. The prevalence is reported as a percentage, and continuous variables are reported as mean ± standard deviation, univariable analysis to test the association between CMD and other categorical variables was done using simple logistic regression. All the factors which were significantly associated with CMD (P< 0.05) in univariable analysis were included in the model for multiple logistic regression to find the independent predictors of CMD. Potential interactions were also tested using logistic regression. The sociodemographic characteristics of the study population were also compared with the data from a nationwide representative sample using Chi-square test. All statistical tests were considered statistically significant at a P < 0.05. Out of the total 288 elderly individuals in Thondamanatham village, 243 (84.4%) were included in the study. Of the remaining, 25 (8.7%) could not be contacted despite three house visits, 19 (6.6%) complained of hearing difficulties, and 1 (0.3%) was mentally challenged. Among the elderly who were deaf, 6 (31.6%) were young-old, 4 (21%) were old-old, and the remaining 9 (47.4%) were from the oldest-old age group. Nearly two-third (73.6%) of the deaf elderly were women. Almost all of the elderly who were deaf (89.5%) had no formal education, and none of them were working. Women constituted 63% of the study population. Most of the study population had no formal education and were from socioeconomic class IV. The demographic characteristics of the elderly are given in [Table 1]. The prevalence of CMDs among the elderly was 51.03% (95% confidence interval (CI): 47.78%–57.25%). The odds of occurrence of CMD in elderly of different age group was not found to be statistically significant. The odds of women having CMD was 1.76 times that of men, and this was statistically significant (P = 0.037). As compared to elderly with no formal education, those with upper primary (odds ratio [OR] =0.37) and secondary level education and above (OR = 0.22) had lower odds for CMD (P< 0.05). As compared to those from Class 1 socioeconomic status, those from Class 4 (OR: 4.02) and Class 5 (OR: 3.6) socioeconomic status had higher odds for CMD (P< 0.05). 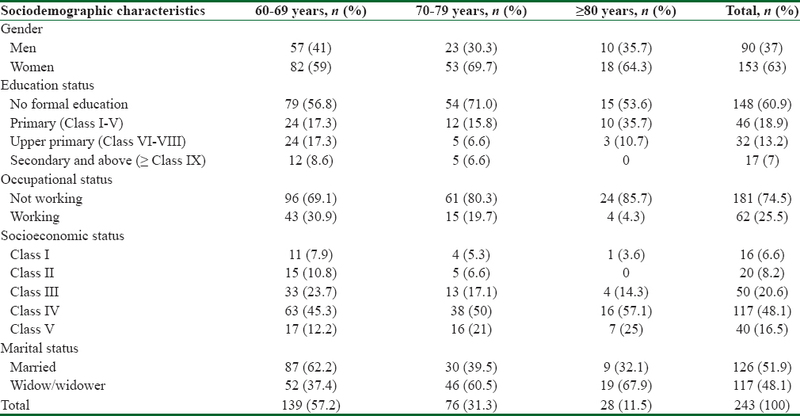 As compared to married elderly, widowed elderly (OR = 2.44) had higher odds for CMD (P = 0.001) [Table 2]. Univariable analysis showed that gender, education status, socioeconomic status, and marital status were significantly associated with CMD. All these factors were included in the multiple logistic regression model (model 1) as covariates. The model was statistically significant χ2 (9) =22.99, P = 0.006. The model explained 12.0% (Nagelkerke R 2) of the variance in CMDs and correctly classified 63.4% of cases. 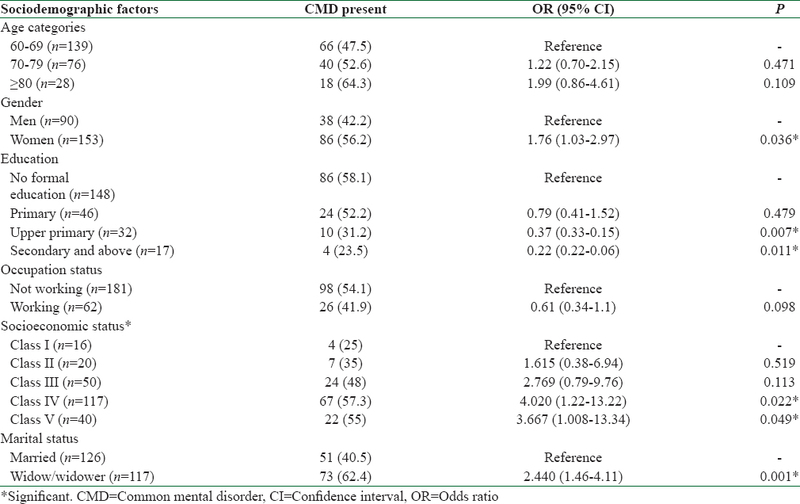 It was found that after adjusting for other covariates, widowed elderly had significantly greater odds for CMD (OR: 2.107 [CI: 1.09–4.06]) [Table 3]. To check if the results were affected by an interaction between gender and marital status, we included an interaction factor to the above model (model 2). However, the interaction between gender and marital status was not found to be significant, and the model R 2 did not improve. Hence, model 2 was rejected. 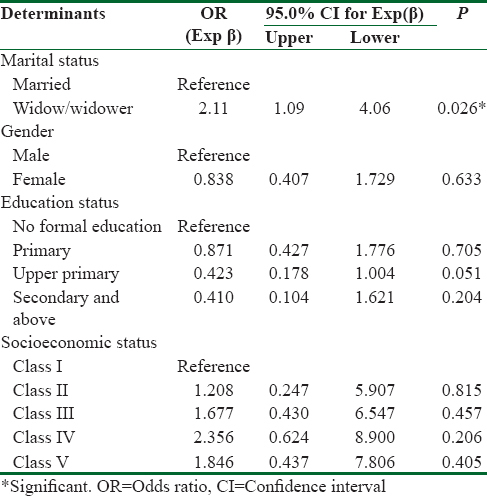 The sociodemographic characteristics of the study population were compared with the data from a nationwide representative sample (Report of the Status of elderly in India), and it was found that the sample included in the present study differed only based on marital status [Table 4]. The nationwide representative data showed that only 36% of the elderly were widowed as compared to 48.1% in the study. Two hundred and forty-three elderly individuals from Thondamanatham village were included in the study to assess the prevalence and correlates of CMD. The prevalence of CMD was found to be 51.03% (95% CI: 47.78%–57.25%). The univariable analysis showed that women and widowed elderly had higher odds of having CMD compared to men and married elderly, respectively. It also showed that elderly with education status of the upper primary level and above had lower odds of having CMD as opposed to elderly with no formal education. Further, the elderly from Class I socioeconomic status was found to have lower odds for having CMD as compared to elderly from Class IV and Class V socioeconomic status. Multivariable analysis showed that after adjusting for gender, education status, and socioeconomic status widowed elderly were found to have higher odds of having CMD as opposed to married elderly. Studies were done by Kamble et al. (2012) and Seby et al. among elderly in rural Maharashtra and Pune, show that the prevalence of CMD varies between 31% and 43%., Studies done in other countries have found a lower prevalence of CMD (18%–38.3%) as compared to this study., These differences are due to the varied socioeconomic milieu in the study regions. Loss of spouse leads to emotional and social isolation, and this may lead to CMD. The educated elderly may have better awareness about health facilities. Elderly with better education and those from Class 1 socioeconomic status tend to enjoy the respect of their family and community and hence may not be vulnerable to suffer from CMD. Some of the strengths of the study include the use of a standard validated questionnaire to screen for CMD, adequate training of the investigator for administering the questionnaire, and that more than 85% of the elderly were included in the study. The study population significantly differed from a nationally representative survey  conducted among elderly on the distribution of gender and marital status. The study population had a significantly higher proportion of women and widows/widowers [Table 4]. This could limit the generalizability of the study results. The higher proportion of women and widowers in this study could be because of the differential mortality rates among men and women in the middle age groups in Thondamanatham. In an unpublished study done in the service areas of JIRHC, it was found that the age-specific mortality rate in the 46–50, 51–55, and 56–60 years' age categories were 1090, 1764, and 2649 deaths/100,000 population for men and only 362, 0, and 574 deaths/100,000 population for women, respectively. The prevalence of CMD among the rural elderly in the study was 51%. Loss of spouse emerged as an independent predictor for CMD. The evidence from the study should be interpreted keeping in view the cross-sectional nature of the study design. Analytical study designs such as case control/cohort study need to be done in future to study the correlates of CMD. However, as a first step in integrating mental health of elderly in the primary health-care services, widows/widowers who attend the outpatient departments could be targeted for opportunistic screening of CMD. We agree to be accountable for all aspects of the work in ensuring that questions related to the accuracy or integrity of any part of the work are appropriately investigated and resolved. Ageing and Life Course: Interesting Facts about Ageing. World Health Organisation. Available from: http://www.who.int/ageing/about/facts/en/index.html. [Last cited on 2013 Jul 23]. Ravishankar A. Population ageing progress in India, ageing & society. Indian J Gerontol 2010;20:17-32. Media Centre: Mental Health and Older Adults. World Health Organisation; 2015. Available from: http://www.who.int/mediacentre/factsheets/fs381/en/. [Last cited on 2015 Jan 13]. Risal A. Common mental disorders. Kathmandu Univ Med J (KUMJ) 2011;9:213-7. Kamble SV, Ghodke YD, Dhumale GB, Goyal RC, Avchat SS. Mental Health Status of Elderly Persons in Rural Area of India. Indian J Basic and Applied Med Res 2012:1:309-12. Dean A, Sullivan K, Soe M. OpenEpi: Open Source Epidemiologic Statistics for Public Health. Available from: http://www. OpenEpi.com. [Last cited on 2015 Mar 18]. Kuruvilla A, Pothen M, Philip K, Braganza D, Joseph A, Jacob KS. The validation of the Tamil version of the 12 item general health questionnaire. Indian J Psychiatry. 1999;41:217-21. IBM SPSS Statistics for Windows, Version 21.0. Armonk, NY: IBM Corp; 2012. 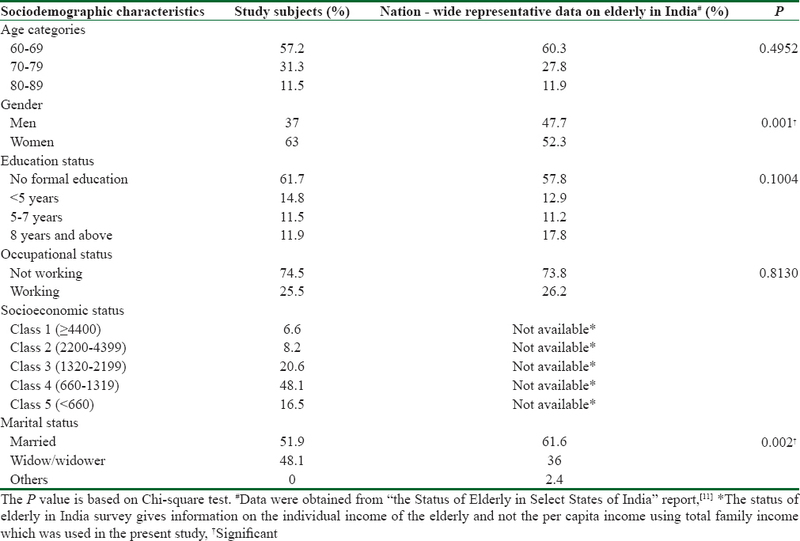 Report on the Status of Elderly in Select States of India, 2011. United Nations Population Fund; 2012. Available from: http://www.isec.ac.in/AgeingReport_28Nov2012_LowRes-1.pdf. [Last cited on 2015 Mar 18]. Latiffah AL, Afiah NM, Shashikala S. Psychological well-being of the elderly people in peninsular Malaysia. Int Med J 2005;4:38-43.